I recently told my wife that I have become so accustomed to cloud office tools that I sort of resent the times when I have to actually open a file using Word or Excel. It was in jest (mostly), but in my opinion there is a better way. There is a better way to co-create a proposal or functional specification. There is a more effective way to receive and provide feedback on a presentation, or schedule a meeting, or chat in real time with a teammate. This line of thought lead me recently to present at a Little Rock Drupal meetup on collaboration tools that Mediacurrent uses to effectively work with 43 teammates across 12 states as well as clients all over the country. Though I’m a huge fan of working remotely, you don’t have to work remotely to benefit from the many online tools available these days. People working in the same office can definitely benefit from implementing some of these tools into their daily workflow. Disclaimer: There is no such thing as a perfect productivity tool for everyone. Emailing: a basic component for any type of business. Calendaring: unless you are working on a project for yourself, you’ll likely need to schedule a meeting. Creating docs, spreadsheets, presentations, etc. : aka a productivity or office suite. Using your personal workflow: the way your flow flows into other things. 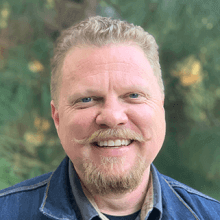 Managing a shared code repository: I’m a project manager, but the developers tell me this is very important. Calling clients and coworkers: Because actually talking is still important. Centralizing communication within a project: Where you keep the lion’s share of data, decisions, notes, tasks, and milestones. In my opinion, the best tool for the first three bullets (Email, Calendar, Docs, Spreadsheets, Presentations, etc.) is a no brainer. Google Apps for Work (previously called Google Apps for Business) provides a solid suite of tools to collaborate with clients and coworkers. 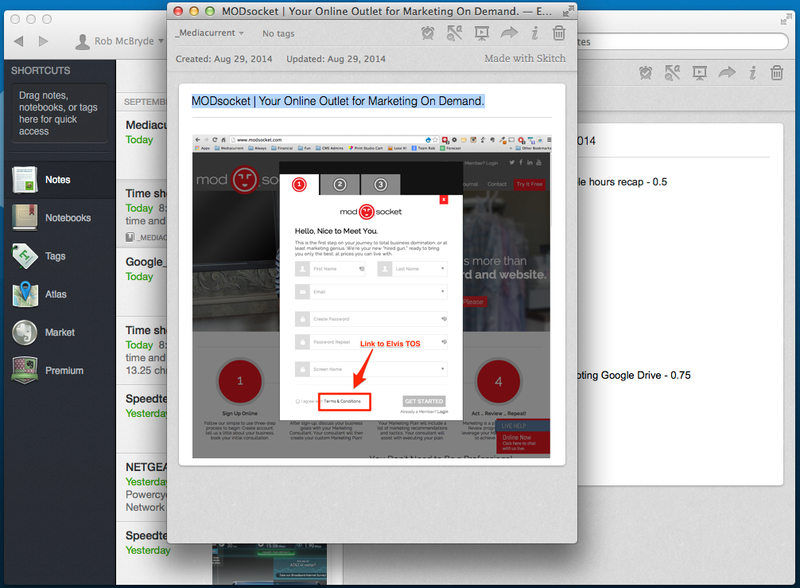 Mediacurrent uses Google Apps to power our email, share calendars, docs, spreadsheets, and slides. Using shared calendars to schedule meetings is an essential feature for any business. This provides visibility required to know when coworkers have openings for meetings, see RSVPs, and set reminders for meetings. Emailing meeting guests through the calendar is also super handy. The project management team uses a shared spreadsheet for forecasting each team’s developers and allocating time each week per client. Everyone can view this spreadsheet to see the latest updates in resource allocation across numerous projects. There is a science to balancing company workload with clients’ budgets. This shared spreadsheet is critical to Mediacurrent’s success in keeping developers loaded up (but not overloading them) and tracking the big picture for forecasting future human resource needs and allocations. Each team member has his/her own way of managing daily routines and tasks. My day always starts and ends with Evernote. Each morning I create a new note to track my time and meeting notes. (ex. “Time sheet for Tuesday, September, 9, 2014”). This serves as my personal log at the end of the day when I have to enter time against client projects or internal initiatives. I often find myself using its search function to refer back to old meeting notes. My favorite Evernote feature is an add-on extension called Skitch. This is where my personal workflow and collaboration intersect. Using the Skitch app on my Macbook, I take screenshots of websites and use the simple Skitch markup tools to ask for or provide greater clarity. A picture truly is worth a thousand words. After you take the screenshot, mark it up with arrows, boxes, and/or text, there is a handy “Share and Copy URL” button so you can quickly post the image to Skype, Slack or wherever. If I’m sending the image in an email or posting as a comment in Open Atrium, I save the image as a JPG or PNG and insert it inline for the benefit of the recipient. Less steps to see the marked up image! The Passpack website states, “Who needs password management? You do.” They are correct. There is a better way to storing your many passwords than writing them on the back of your checkbook register. (I’m looking at you, dad.) This is especially true for those working with multiple organizations and team members. Web developers, whether collaborating with others or working independently, should use a service for code management with distributed version control systems. For more info on this, check out this post called “Getting Git: An Intro For Beginners.” Most Mediacurrent project repos are stored on bitbucket.org. For that not so far away feeling, the chat window is an indispensable tool for team communication. This is probably my favorite category of tool because of real time communication that can occur. A quick back and forth in a chat thread provides that instant communication that is far less time consuming than waiting for an email. Skype has always been MC’s primary internal communication tool for messaging and calling team members. It does an adequate job for chatting, group video calls and even screen sharing. As Mediacurrent’s team has grown and more integrated services have become available, we recently evaluated a few alternatives to Skype that could also replace Yammer (described in this post) and added a few new features that are just icing on the cake. Slack is used for morning check-ins with priority lists, team discussions about projects and topics, and direct messaging for chats with individuals. 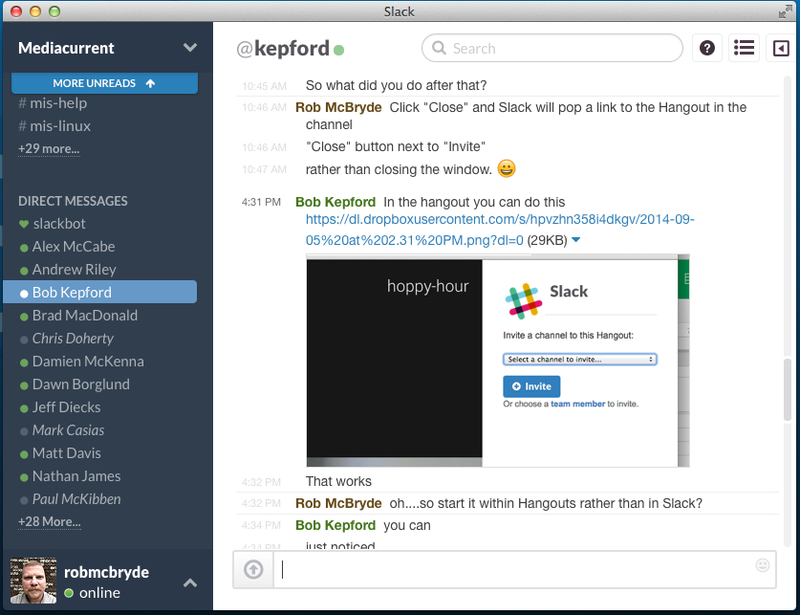 Slack serves as a replacement for several features of a traditional office environment for a distributed team, such as conference rooms, hallway conversations, the ability to stop by someone's desk to check in, announcement boards in the lunch room, etc. and has a well designed mobile app that outperforms Skype’s app by a mile. Where do you house the client and project-based streams of consciousness (aka a project management system)? Mediacurrent uses Open Atrium for this. Though we have customized our version of OA to suit specific needs (largely around reporting), out of the box OA can be configured for the most common project management needs such as creating groups and projects, creating and assigning tasks within a designated project, and receiving notifications when a teammate has completed a task or is asking the client for further direction. Another tool used by the PMs and executive management is called Trello. We use this to track the incoming sales pipeline and high level account status updates. Our Account Status board is arranged in columns starting with Sale Procurement (projects that are coming soon) and ending with Complete (finished projects or support agreements). 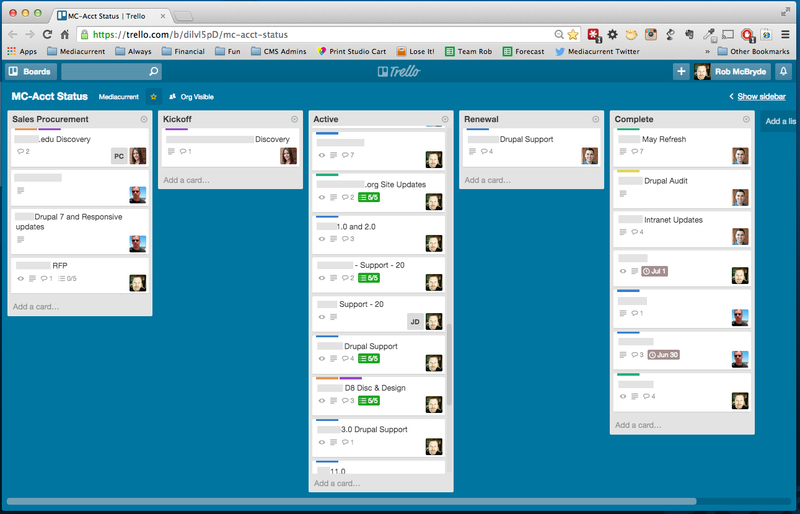 Trello “cards” can have comments, attachments, votes, due dates and checklists on them. The PMs input our own standardized set of vital project data and use the commenting field for the latest high level updates which we review in our weekly PM call. It’s a simple and intuitive application and provides a slick drag-n-drop interface for moving cards around. There is no shortage of cloud productivity tools from which to choose. So many tools for many tasks. Choose the one that works best for you and your team and establish a recurring workflow for common tasks.